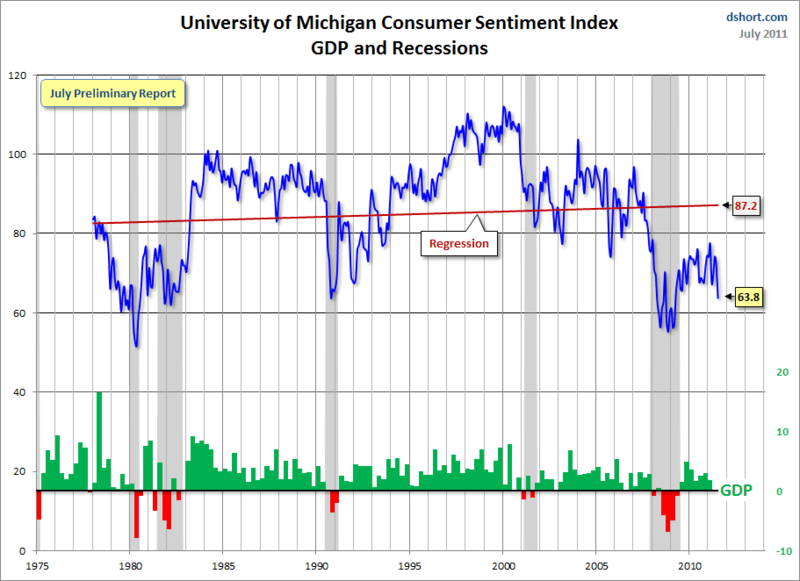 The University of Michigan’s / Thomson Reuters widely-watched consumer confidence index shows consumer confidence moving lower driven by lack of confidence in government economic policies and increasing pessimism over unemployment, home prices and falling income. The index fell 7.7 points to 63.8, its biggest decline since March with the index falling to 76.3 from 82.0, the lowest reading since November of 2009. One issue at the forefront of eroding consumer confidence is the impending budget deal debacle which will decide the fate of whether or not the US debt ceiling can be increased, allowing the United States to continue funding its monthly obligations. Adding to consumer anxiety is credit rating agency Standard & Poor’s statements this week that there is a 50 per cent chance it will downgrade the U.S. government’s credit rating within three months because of the congressional infighting over approving an increase in the debt ceiling. The rating agency has placed the United States on a credit watch, not good news for the economy or consumers. Much of the slowdown in aggregate demand this year has been centered in the household sector, and the ability and willingness of consumers to spend will be an important determinant of the pace of the recovery in coming quarters. Real disposable personal income over the first five months of 2011 was boosted by the reduction in payroll taxes, but those gains were largely offset by higher prices for gasoline and other commodities. Households report that they have little confidence in the durability of the recovery and about their own income prospects. Moreover, the ongoing weakness in home values is holding down household wealth and weighing on consumer sentiment. On the positive side, household debt burdens are declining, delinquency rates on credit card and auto loans are down significantly, and the number of homeowners missing a mortgage payment for the first time is decreasing. The anticipated pickups in economic activity and job creation, together with the expected easing of price pressures, should bolster real household income, confidence, and spending in the medium run. The silver lining for mortgage rates is that bad economic news results in lower or depressed mortgage rates. We can help you decide if you in the best mortgage for your needs or if a lower rate is available. Please contact us today for your free existing or future mortgage consultation.